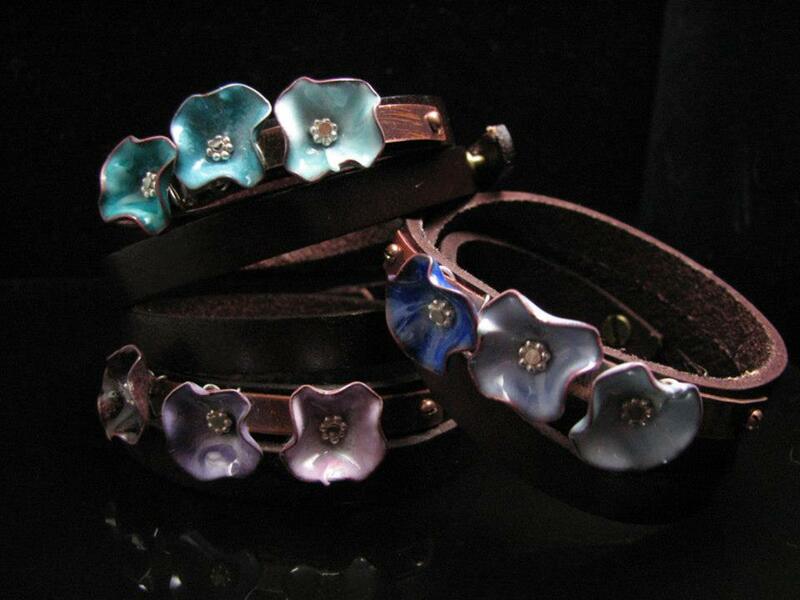 Recycled from Grandma’s kitchen – are two silver plated butter knives that are formed into cuff bracelets. Handmade metal work flowers are coated in vitreous enamels in two shades green and torch-fired at 1500 degrees to produce the luster finish you see. 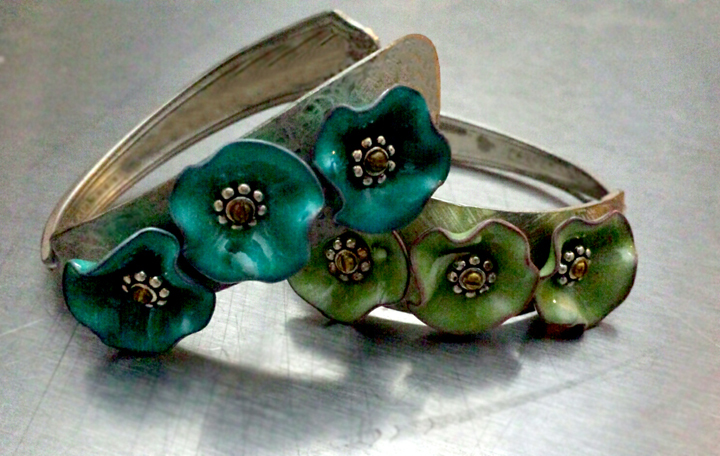 The enamel flowers are attached to the cuff bracelet with micro-screws to complete the look. 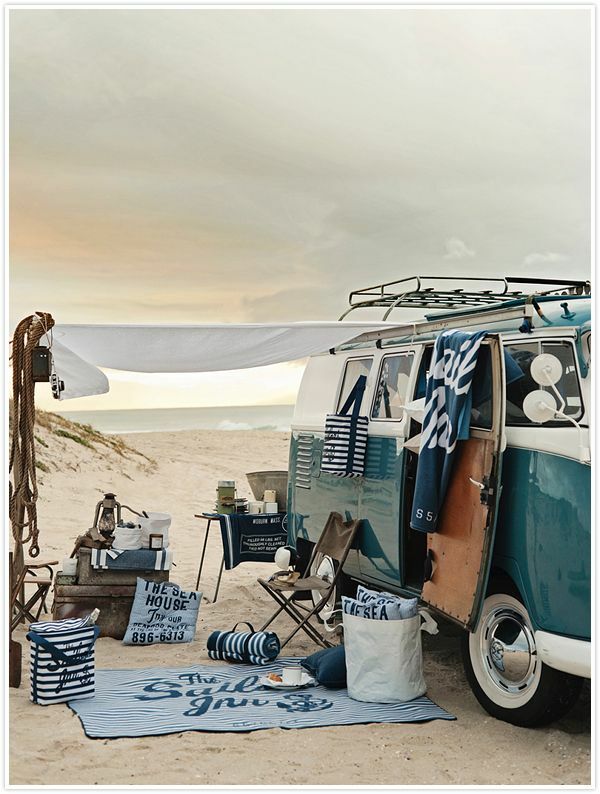 The visual inspiration for these recycled pieces is the photo seen here. 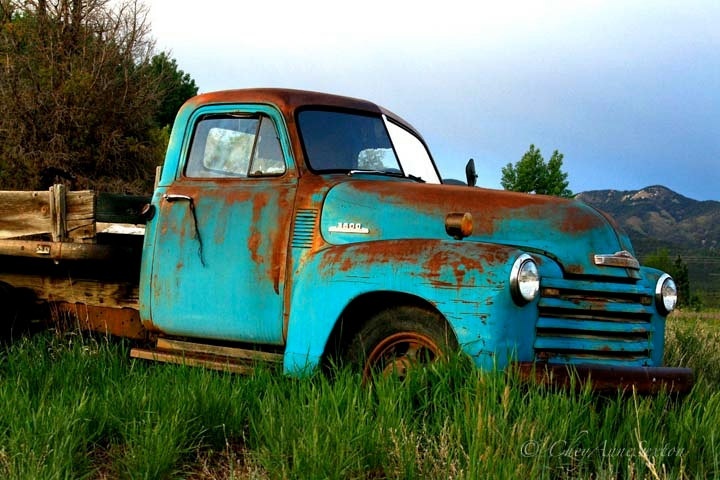 Old trucks, fresh from the farm, have a wonderful assortment of rich patina colors. 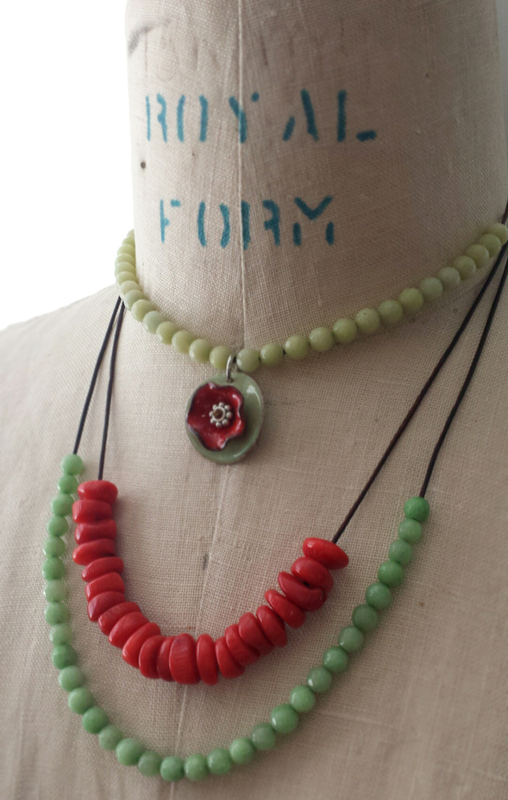 Round cut jade beads in a darker shade of green (appreciated for guarding its wearer against accidents and misfortune) are found on the lowest strand; cherry red natural coral beads on the center strand and round jade beads in an opaque pale green finish off the top-tier of this adjustable necklace. A handmade metalwork base and flower are coated in lichen green and fire-red enamel respectively, and serve as a unique focal piece. 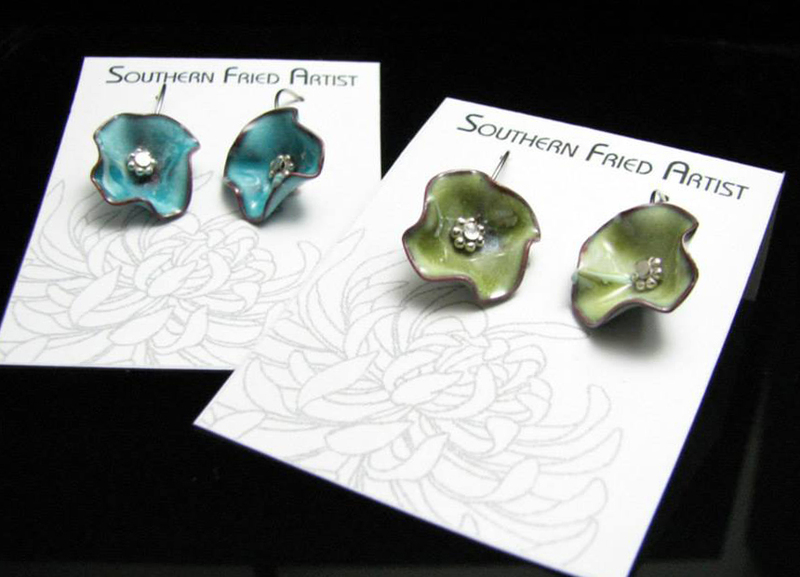 Each enamel piece is hand-formed; coated in vitreous enamel and torch-fired at more than 1500 degrees. Dark brown genuine leather cording completes the look. 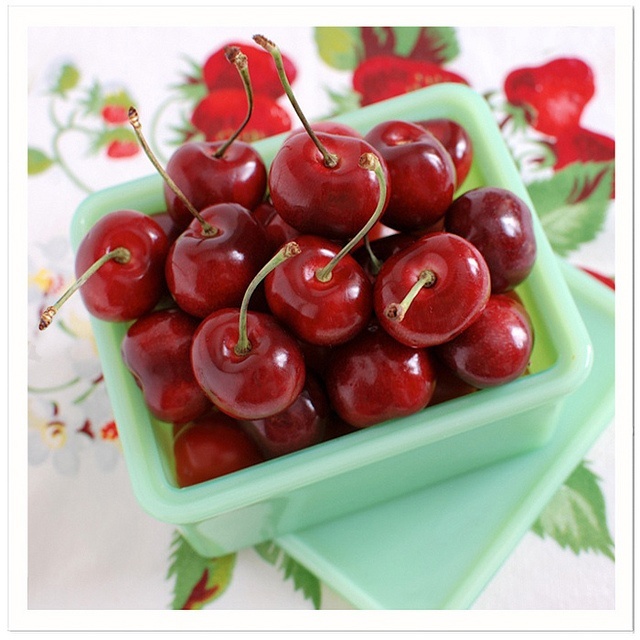 This look was inspired by the appeal of vintage green milk glass bowls filled with fresh cherries – pictured here. Great when paired with a sundress or used to brighten a pale winter sweater. Impression Jasper rondelles (appreciated for providing its wearer with inner peace, clarity and compassion) are found on the lowest strand; fire polished Czech glass in root beer on the center strand and round Czech glass in opaque pale turquoise finishes off the top tier of this necklace. Handmade metalwork flowers coated in lichen and beryl green enamel are affixed to a reclaimed silver plated spoon handle and serve as a unique focal piece. Each enamel piece is hand-formed; coated in vitreous enamel and torch-fired at more than 1500 degrees. 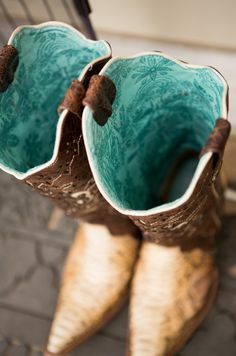 Pale turquoise knotting cord and genuine leather cording complete the look. The beads are free-flowing on the strands so that they move with you. The color choices for this piece were influenced by the photo below. This necklace is easy to wear and looks great whether you dress it up or wear it with your favorite pair of jeans and cowboy boots. 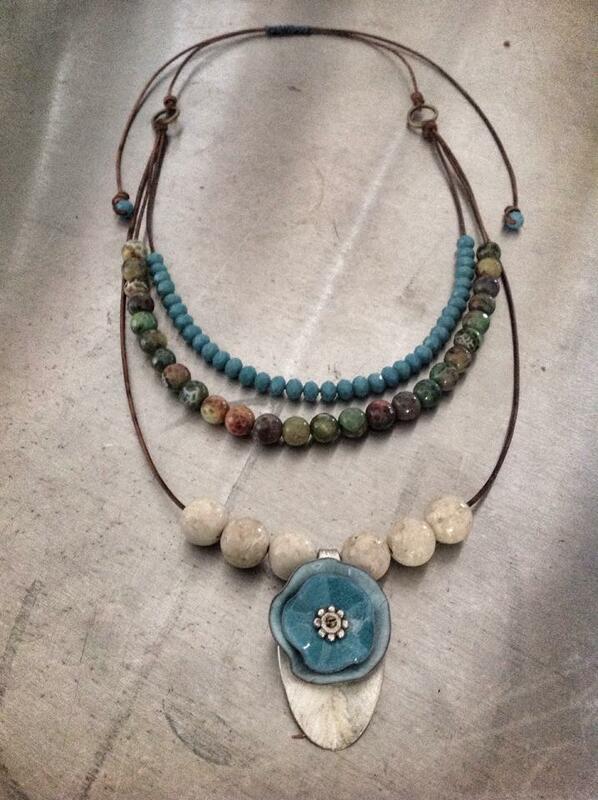 Round limestone beads (formed by swift currents in the sea) are found on the lowest strand; fire agate faceted beads (on the center strand) have a deep calming energy that brings security and safety and round Czech glass in opaque turquoise finishes off the top strand of this necklace. Handmade metalwork flowers coated in sky blue and sea foam green enamel are affixed to a reclaimed silver plated demitasse spoon and serves as a unique focal piece. Each enamel piece is hand-formed; coated in vitreous enamel and torch-fired at more than 1500 degrees. Genuine leather cording completes the look. 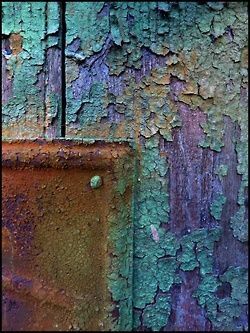 My color inspiration for this piece was influenced by the photo below. 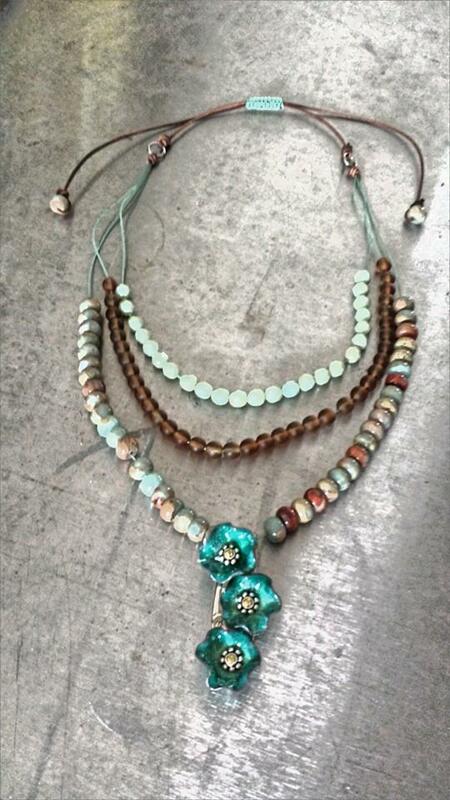 This necklace reminds us to slow down and remember those lazy summer days spent at the beach. 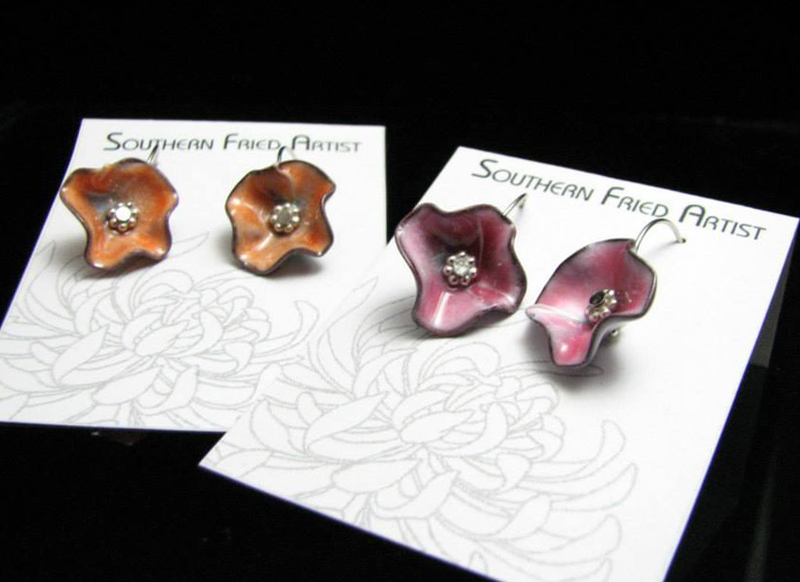 These earrings are like your favorite pair of jeans, boots or a softly worn leather belt. Hand-hammered earrings are formed and manipulated from sterling silver wire. The enamel dangle pieces are also hand formed and torch-fired at more than 1500 degrees. They’ve been added to give just a hint of color. 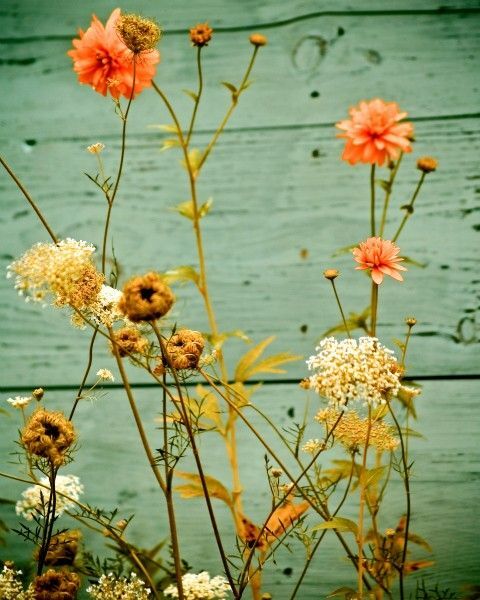 The inspiration for these lovelies is the photo below. 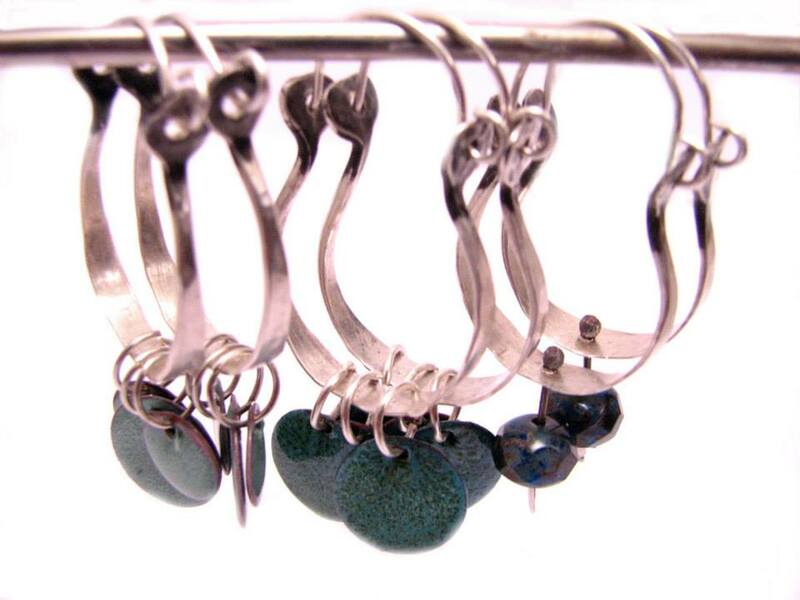 Well worn, light weight and comfortable will come to mind as these earrings grace your ears. Dress up with your favorite long skirt and boots or down – with your favorite t-shirt and jeans. Despite the name – these are anything but weathered. 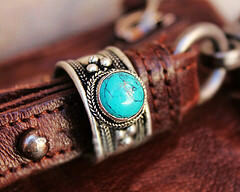 Soft leather wrap bracelets are the base for several different hues of patinas that occur in nature. It’s when rain and the environment meet metal – but captured in viterous enamel instead. The enamel is torch-fired at more than 1500 degrees to preserve the colors. These pieces remind us that with ages comes beauty. The inspiration for these colors is the beauty that is displayed in the photo below. Multiple shades of browns, purples and turquoise can either be dressed up or worn with casual attire. Fall may be the time of year where folks believe that things are getting ready for the slumber of winter. I think that fall produces some of the most beautiful subtle colors. Hand-formed metal bases are coated with muted enamel colors. These are torch-fired at 1500 degrees to produce a long wearing finish. As you can see by this inspirational photo – there are fall hues that are high contrast, but light in color. Lovely enough to wear anytime, these earrings are sure to become a favorite of yours.